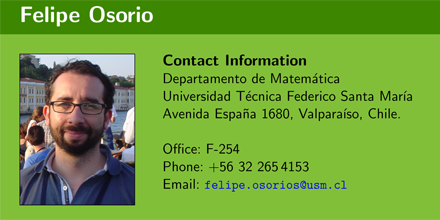 I am Assistant Professor at the Department of Mathematics of the Universidad Técnica Federico Santa María, Chile. In August 2006, I completed my doctorate degree in Statistics at University of São Paulo, Brazil under the direction of Dr. Gilberto A. Paula. I am interested in the application of diagnostic and sensitivity techniques in statistical models as a mean to criticize and to improve the modeling process. I maintain contact with researchers of the ICMC-USP collaborating in the development of the estimation and influence diagnostic procedures in linear and non linear mixed-effects models under non-normal distributions as well as the computational implementation of such techniques. Vallejos, R., Osorio, F., Bevilacqua, M. (2018+). Spatial Relationships Between Two Georeferenced Variables: with Applications in R.
To appear in Springer. Number of pages: ≈ 180. Leal, C., Galea, M., Osorio, F. (2018). Local influence for the concordance correlation coefficient. Assessment of movement difficulties in Chilean preschoolers. Vallejos, R., Barraza, W., Osorio, F., Ojeda, S.
Statistical estimation of structural similarity coefficients for images. Acosta, J., Osorio, F., Vallejos, R. (2016). Effective sample size for line transect sampling models with an application to marine macroalgae. Journal of Agricultural, Biological, and Environmental Statistics , 21 (3), 407-425. Acevedo, C., Tomic, G., Santander, R., Creixell, W., Osorio, F., Sánchez, E. (2016). A Chemometrics approach to analysis volatile molecules released by post-mortem bovine fast-twitch muscles. CyTA - Journal of Food , 14 (3), 399-404. PDF. Influence diagnostics for robust P-splines using scale mixture of normal distributions. Annals of the Institute of Statistical Mathematics , 68 (3), 589-619. PDF. Vallejos, R., Osorio, F., Mancilla, D. (2015). The codispersion map: a graphical tool to visualize the association between two spatial variables. Statistica Neerlandica 69 (3), 298-314. PDF. Vallejos, R., Osorio, F. (2014). Effective sample size of spatial process models. Spatial Statistics 9, 66-92. PDF. Meza, C., Osorio, F., De la Cruz, R. (2012). Estimation in nonlinear mixed-effects models using heavy-tailed distributions. Statistics and Computing 22 (1), 121-139. PDF. Osorio, F., Paula, G.A., Galea, M. (2009). On estimation and influence diagnostics for the Grubbs' model under heavy-tailed distributions. Computational Statistics & Data Analysis 53 (4), 1249-1263. PDF. Cademartori, D., Navia, R., Galea, M., Osorio, F. (2008). Prediction of the economic activity from the short and long-term interest rate differential: New evidences in Chile and the United States of America cases. Applied Economics Letters 15 (9), 707-712. PDF. Osorio, F., Paula, G.A., Galea, M. (2007). Assessment of local influence in elliptical linear models with longitudinal structure. Computational Statistics & Data Analysis 51 (9), 4354-4368. PDF. Osorio, F., Galea, M. (2006). Detection of a change-point in Student-t linear regression models. Statistical Papers 47 (1), 31-38. PDF. Smoothing parameter selection and outliers accommodation for smoothing splines. In Proceedings of the 58th World Statistics Congress of the International Statistical Institute, Dublin, Ireland. Session CPS008, 6037-6042. De la Cruz, R., Eyheramendy, S., Meza, C., Osorio, F. (2010). Exact estimation procedures in a spatial mixed-effects probit model with binary outcomes. In JSM Proceedings , Statistical Computing Section. Alexandria, VA: American Statistical Association. 3629-3637. Osorio, F., Vallejos, R., Cuevas, F. (2016). SpatialPack: Computing the association between two spatial processes.